NEW YORK — How bad has Chris Sale looked through the early part of this season? Even Mike Tauchman, who you almost certainly have never heard of before today, is getting greedy with his hits off the seven-time All-Star and erstwhile ace of the reigning champions. “The one off Sale? That was a double? 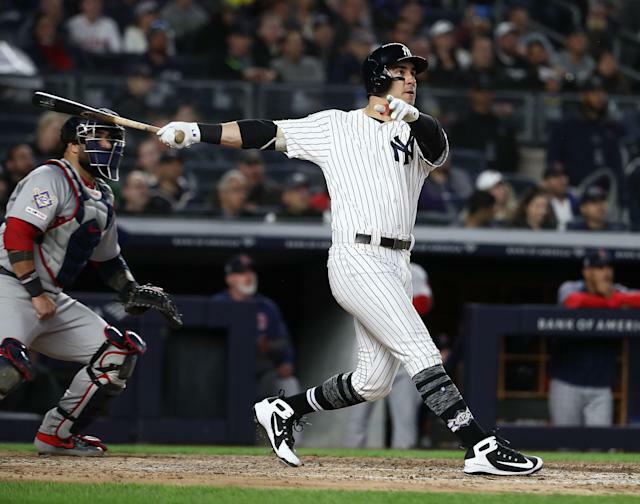 That’s a bummer,” Tauchman told reporters after the New York Yankees’ 8-0 romp over the Boston Red Sox on Tuesday night. The hit in question came in the fourth inning, knocking in Austin Romine for the fourth and final earned run of Sale’s fourth loss in as many starts this season. Tauchman went to third on the throw home and was unaware it was scored a measly double — one of seven hits Sale allowed in five innings. Two innings later, the 28-year-old did a lot more than just scratch one across. For his first career home run, coming in his 62nd game and third partial season, Tauchman launched a three-run shot off Erasmo Ramírez into the second deck in right field. Tauchman seems quick to quip in general. Asked if it was special to experience his first home run as part of the storied rivalry between New York and Boston, he countered, “I’d have loved it in the first at-bat I ever had.” But the backup left fielder, pressed into duty by injuries to Aaron Hicks, Giancarlo Stanton, and 10 Yankees whose jerseys you might actually have at home, was rendered not-quite speechless but certainly less than eloquent by the experience. He attributed his success — the Yankees didn’t need ‘em considering James Paxton’s lights-out performance, but Tauchman had four RBIs, his first multi-RBI game — to finally getting a little bit of consistency. It makes sense that Tauchman, who was traded to the Yankees from the Colorado Rockies just before opening day and missed all of spring training with his new star-studded team would still be finding his place in the clubhouse. In the postgame media frenzy, he was set to talk to reporters right after Aaron Judge. But even though the PR person told him it was time to take his place in front of the logoed backdrop, in the center of the scrum, Tauchman hung back. With so many Yankees on the IL, Tauchman is likely facing more playing time in the weeks to come. And with that, the chance to make himself known in the clubhouse and around the city. After all, winning is the best icebreaker.